Rise and Shine! Our assorted mixed set of six Iron Roosters is back again for one last doodle-doo! One of the first classic original sets, this rooster bird collection is back and ready to impress! Send a set to a friend who loves decorating with roosters, or buy a set and pass them around to five friends and keep one for use as front porch decor. Each metal rooster design is a work of garden art, hand painted and lacquer coated for brilliance and long lasting shine. 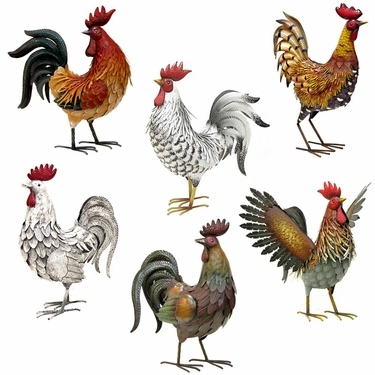 Decorate your garden or home with these lovable rooster friends, you'll love them! Size: Approx: 18" x 24", all Metal.